The reigning NSW champions and third placegetters at the 2018 Australian Championship, Byford and Hudson are making no bones about their desire to ramp it up a notch this year, despite a larger field than last time around. However, the Pittwater pair by no means had it all their own way, they lead by one point from Alan and Tom Quick, recently crowned Farr 40 NSW champions. The CYCA father and son may have switched one-design classes, but they arrived fully cocked and loaded with The Goat, scoring a pair of third places and a win for second place overall. Conspiracy though, also won Boat of the Day, and proudly flew that flag, co-owner, David Hudson said. With guru David Chapman calling the shots “and he’s doing main as well,” Quick said, The Goat crew went in with heads down and tails up, as some got their heads out of the Farr 40 and into the Sydney 38 – very different boats. ”It’s been five years since we sailed a Sydney 38 - so it was a bit different coming back – but it was good. We’re enjoying the boat. It was a nice range of wind – perfect really. We had only one problem; getting a jib up in Race 3 when we were leading. But we got around mark and got it up and still won - no other dramas. Sailing windward/leeward courses on the Manly Circle, Conspiracy pipped Challenge (second at the NSW Championship), Greg Croak’s NSW Central Coast entry, by 27 seconds in the opening race. The Goat took third place, a further 15 seconds in arrears. You could feel class newcomer Peter Sorensen’s frustration, when his recent purchase ‘Advanced Philosophy’ (the former Phoenix, winner of the 2015, ’16 and ‘18 Australian Championships), with Ron Jacobs calling tactics, scored OCS in Race 1. First time jitters, I’m sure, from this local skiff and yacht champion. In Race 2, it was Conspiracy getting the gun again, this time from Phil Tomkins’ Adrenalin (CYCA) and The Goat in third. But in Race 3, The Goat was too ‘Quick’ for the rest, and the CYCA entry took the bullet from Richard Williams’ Calibre, (also CYCA and third at the NSW Championship) by a six second split, with Conspiracy 25 seconds adrift of Calibre. Day 1 of the Yoti 2019 Sydney 38 Australian Championship was in limbo before the midday start time, when a wafting 2-3 knots was all that could be mustered - a moderate north/easterly breeze filtered in just in time. A General Recall started the day, as is sometimes the case in a first race on Day 1 in a high-stakes championship where competitors take the ‘no prisoners’ approach. Competitors in this popular class know how to celebrate and wind down in style after a day of racing, taking in Norths Happy Hour drinks at MHYC on docking, before a dinner for all crews. A fleet of 11 Sydney 38 One-Designs are taking part in the three-day Australian Championship, starting off this weekend’s 14th running of the Sydney Harbour Regatta. It is one of the largest class events for many years, with some new owners and return players from around NSW joining the circuit regulars. 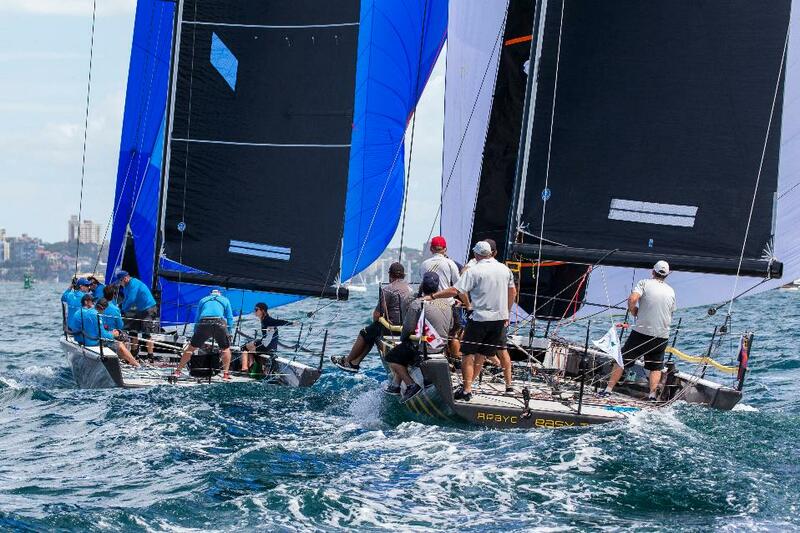 Windward/leeward racing continues on the Manly Circle tomorrow, when officials will aim to put three more races to bed. From the Harbour Bridge and the Opera House, all the way down to the Sound at Manly – boats, boats and more boats, as Middle Harbour Yacht Club’s well-named key event, the Sydney Harbour Regatta, did as its name implies – filled Sydney Harbour with racing boats of all shapes and sizes. And as if that was not enough, the courses extended offshore where the Sydney 38s are conducting their Australian Championship on windward/leeward courses, joined today by the TP52s, plus other grand prix yachts broken into two IRC divisions, all battling for the spoils. Weatherwise, it was similar to yesterday - a moderate 8-13 knot north-easterly – ideal warm autumnal conditions for NSW’s largest keelboat regatta. Racing was every bit as close as it was yesterday, but a new leader has emerged, with Alan and Tom Quick’s chartered The Goat, re-named ‘Outlaw’, toppling current NSW champion, Conspiracy (Peter Byford/David Hudson), from the top of the podium. The Quicks have moved over from their Farr 40 and adapted ‘quickly’ to the Sydney 38 after a few years absence, Tom Quick saying, “We had crew returned from our Farr 40 today. Phil Armstrong, one of our trimmers and kite trimmer came along. He was the big change in our performance. It’s all about the crew – 100 percent it’s the crew that makes the difference. Outlaw scored a trio of wins, while Conspiracy scored 5-2-2 results. In Race 4, Outlaw outgunned Richard Williams’ Calibre by nearly one minute, with Phil Tomkins’ Adrenalin finishing third, making it a CYCA top three. In Race 5, it was Outlaw again, this time from Greg Croak’s Challenge from Toronto, with Calibre third. Race 6, and Outlaw won from Conspiracy by nearly a minute, with class newcomer, and MHYC member, Peter Sorensen (Advanced Philosophy) third. Results have Outlaw on top by seven points over Conspiracy and 10 in front of Calibre. In the other offshore classes, TP52 newcomer, Gordon Ketelbey (Zen) leads with three straight wins. A great result after the disappointment of retiring with damage from the recent Rolex Sydney Hobart. Zen leads Gweilo (Matt Donald/Chris Townsend) and Sam Haynes’ Celestial, with 2008 and 2012 Sydney Hobart winner, Quest (Bob Steel) fourth – as he reacquaints himself with the boat he sold to Paul Clitheroe and repurchased recently. ‘The locals’ Nine Dragons (Bob Cox) and Khaleesi (Andrew and Pauline Dally) continue their usual DK46 stoush in Open Class Division 1, but Cox has a solid five point lead. In Division 2, Blink lost a crew overboard at a bottom mark rounding in Race 3, but crew members on Mark Gorbatov/Mark Siebert’s Sydney 38 reacted quickly, retrieved and kept racing. Unsurprisingly, perennial winner, Colin Gunn (Stormaway) representing MHYC, leads the division from fellow club member, Justin Brownbill’s Botany Access Cocomo. Over 160 boats across 20 diverse classes/divisions are taking part, from the NSW Championships in the Adams 10, Cavalier 28 and J70 to the many others. Nine experienced Adams 10s went hard at it on Day 1. Patrick Delaney’s Powderhulk leads by a single point from Rob Clarke’s KickNChase and Raoul De Ferranti’s Lumine Lunae – the latter two on equal points, so close is the competition. A buoyed-up Delaney commented: “It was very, very close. The starts were very tight and the lead swapped a lot. KickNChase is the Australian champion, so we’ll see if the little Aussie battlers can hold out against them. “Tomorrow will be interesting, with the remaining three races. Today wasn’t easy – we didn’t see more than 10 knots on the Harbour. Race 3 was variable and died towards the end. Winds were very shifty. We’re hoping for a stronger breeze tomorrow – we go better in that. “Backchat (in fourth) has come from Lake Macquarie and has a good crew – they could come good tomorrow. We have a history of starting well, but dropping off, we’ll see,” ended a laughing Delaney. The J70 NSW Championship is also a hotly contested affair. Currently Jervis Tilley (The Jackal) leads Tim Ryan’s James and Reg Lord’s Juno after three races, while Andrew McPherson’s U2 leads the NSW Championship in the Cavalier 28 class. One point separates U2 from Centaurius (Craig Mitchell) and Phil Mahoney’s Blind Justice. McPherson was rather tickled to find U2 in front: “A gorgeous day’s sail. We sailed one crew short and had two stand-ins, because three of my regulars couldn’t make it. We managed to get through, but I’m happily surprised we’re leading,” he said. This is the 14th running of the Sydney Harbour Regatta, conducted by MHYC, which is in the throes of celebrating 80 years. All competitors are flying Clean Up Australia flags from their backstays in support of Clean Up Sydney Harbour on Sunday, which is celebrating its 30th year. The late Ian Kiernan AO would be thrilled to see the legacy he left behind growing. Racing on Sydney Harbour and offshore courses concludes tomorrow and would not be possible without the continued assistance of: the Cruising Yacht Club of Australia, Manly Yacht Club, RANSA, Royal Prince Alfred Yacht Club, Royal Sydney Yacht Squadron, Royal Prince Edward Yacht Club, Sydney Amateur Sailing Club and the Sydney Flying Squadron. Thanks go to key sponsors Helly Hansen, Air New Zealand, Robert Oatley Wines and Abell Point Marina, along with supporting sponsors Mercure Resort Hunter Valley Gardens, Smooth FM, Club Marine, Vittoria Coffee and KeySun. Winners were crowned on the final day of the Sydney Harbour Regatta, conducted by Middle Harbour Yacht (MHYC), over three days for the Sydney 38s and the weekend for all other classes. This is the 14th running of the regatta for MHYC, which is in the throes of celebrating 80 years. All competitors were flying Clean Up Australia flags from the backstays in support of the 30th Clean Up Sydney Harbour today. The late Ian Kiernan AO, who would be thrilled to see his legacy continuing to grow. Jervis Tilly has won his first sailing title as a skipper, sailing The Jackal to a four-point win over the ever-competitive Juno, owned by Reg Lord. Tilly commented: This is my first title in this class – or any class – and my first year in the J70. This is the boat you want to have for this type of racing. It’s strictly one-design, it leaves you to concentrate on the sailing aspect. Chris Way, renowned for his various boats named ‘Easy Tiger’, won the Super 12s on countback with his MC38, Easy Tiger VI. It was Way all the way in the final race, which nailed the top spot for him after three boats came into the final day within a point of each other. Adrian Walters’ Rob Shaw 11 Meter, Little Nico, finished second overall on equal points with Easy Tiger VI, finishing ahead of three other MC38s. “It all came down to the last race – four boats could have won. Three were within a point of each other coming into today – us winning the final race was crucial. Dark Star (John Bacon) didn’t have such a good day in the last two races, which cut her out of the running,” Way said. 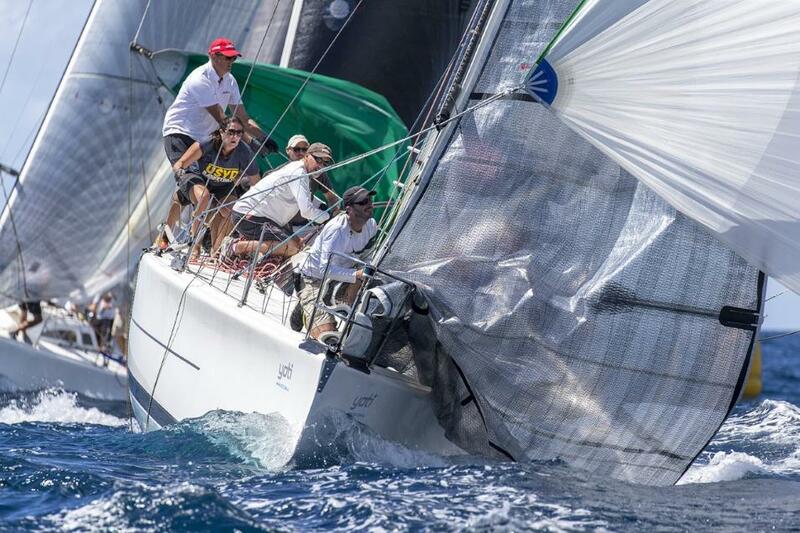 “It was very close racing and a good tune up for the MC38 Nationals in two weeks on Pittwater. We’ve been on a steep sail development program and we will have to keep it up for the Nationals, but the new combination seems to be working. “Steve McConaghy was on tactics – he was with me in Pattaya (Thailand) last weekend when we won the Platu class at the Trans Worlds,” ended Way, who is obviously on a roll. Little Nico gets a move on - Andrea Francolini photo - Sydney Harbour Regatta, 2019. Despite not being able to maintain a top performance in the past, according to Powderhulk’s owner, Patrick Delany, he has defied his own statement and sailed Powderhulk to a NSW Championship win in the Adam’s 10. Delany beat nearest rival, Backchat (sailed by gun offshore racer Tom Braidwood) by two points. Delany and Braidwood won two races apiece, but Delany, from MHYC, was the more consistent of the two. “Rocky Balboa won by trying hard against the big fellas,” a laughing Delany said. “It was a good day, but a day of two stories. The left side of the course had less wind, but great lifts. Downwind was a challenge as well; the lead swapped a lot. Greg Purcell has won the Cavalier Championship over John MacLeod’s Quambi by three points. Purcell said the racing was, as always, competitive. “And both days the weather has been fabulous. It was a special event on the Harbour. It’s always good to be out there. Could the weather have been any better – I don’t think so – it was warm and sunny and the fleet sailed in great north-easterlies throughout. Triple Olympian Karyn Gojnich and her Evie crew have won the NSW Yngling title from Hamish Jarrett and his Miss Pibb. Jarrett has been the benchmark in the class in recent years, and Gojnich, who has represented Australia at the Games in the 470 and Yngling classes, did well to finish a clear six points ahead, counting a trio of wins and second places in her tally. 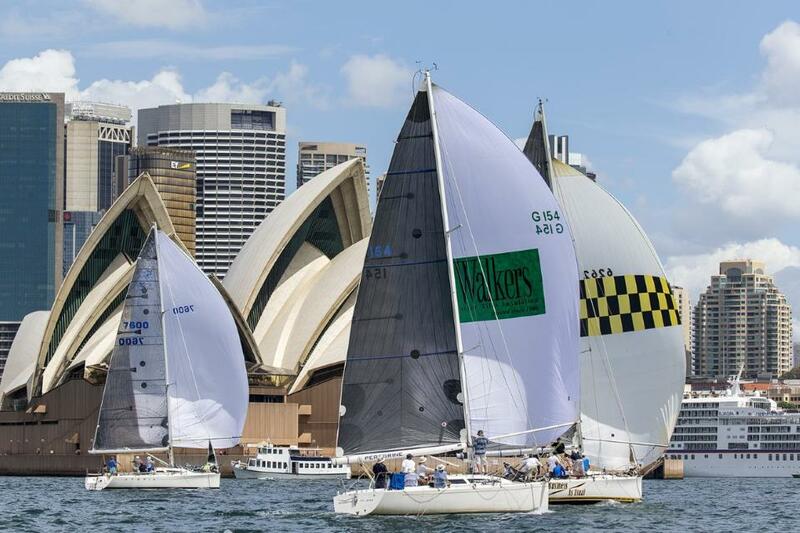 The 2019 Sydney Harbour Regatta included five Championship events - the Yoti Sydney 38 Australian Championship and NSW championships for the Adams 10, J70, Cavalier 28 and Yngling classes – not to mention all the other usual classes. Sailing his Flying Tiger Ophir with wife, Sonia, and two daughters (21 year-old Dana a 470 sailor) and Jessica (an 18 year-old match racing sailor) Bruce Tavener has skated home to claim the Super 30 class by just 1.5 points from Matt Wilkinson’s fast finishing Farr 30, Foreign Affair. “It normally comes down to that,” Tavener said. “We had a really good day yesterday - we knew we had to get our boat speed up and minimise the errors. We had good starts in first two races and picked the shifts nicely. So many classes, we are unable to cover all, but it was evident that everyone who sailed enjoyed the regatta. Volunteers numbered 85 from eight supporting clubs that conducted 94 races on two offshore and six inshore race areas over three sunny days of light to moderate north-easterly breezes. Entries comprised 160, taking in 950 competitors across 18 divisions. The Sydney Harbour Regatta would not be possible without the continued assistance of: the Cruising Yacht Club of Australia, Manly Yacht Club, RANSA, Royal Prince Alfred Yacht Club, Royal Sydney Yacht Squadron, Royal Prince Edward Yacht Club, Sydney Amateur Sailing Club and the Sydney Flying Squadron.